The Thermo HAAKE SC 150 recirculating chiller provides easy to use and efficient closed loop pumping for a variety of applications. This immersion circulator features two levels of pump speed to increase external circulation flow or bath agitation, that can be operated from the digital, back lit control panel. From this microprocessor-controlled head, users can also program 5 temperature set points held in memory, change the digital display resolution from 0.1 to 0.01 for greater control, and choose between °C, °F or K. The SC150 Immersion circulator also features communication options such as RS232, RS 485, Ethernet/LAN and Analog I/0. This digital control head also sounds an alarm alerting you to temperature changes, or low liquid levels, has an auto restart feature in the event of a power failure, and a self-tuning PID control. The Thermo HAAKE SC 150 will also automatically shut down when it detects an excessively high temperature, a motor overload or low liquid level to protect components and samples. 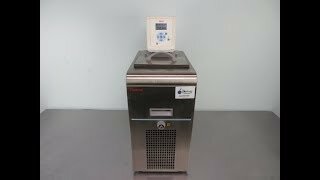 The Thermo HAAKE SC 150 recirculating chiller is set up to control the A 28 Bath, with a stainless-steel interior and 2.64 gallon/10L capacity. This immersion chiller provides a cooling capacity of 320 watts, letting you get temperatures down to -28°C. This circulating chiller has a maximum flow rate of 17L/min, with a pressure of 300mbar/4.35psi. For calibration purposes, Real Temperature Adjustments may be entered through the control head. Users may also select from 3 languages, either English, French or German. This refrigerated circulator is an ideal choice for applications involving calibration, rotary evaporation, condensers, sample and material testing and preparation, and bioreactors. This Thermo Haake SC 150 Recirculating Chiller has been fully inspected and is operating without issue. All of our lab equipment comes backed with our standard warranty. Should you have any questions, please don't hesitate to contact us.